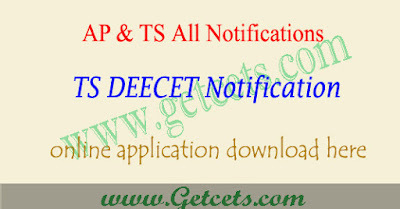 Candidates can check TS DEECET notification 2020, ts dietcet application form 2020, telangana deecet apply online last date, fee structure, exam date, hall ticket download, results and counselling dates through this article. Directorate of School Education Telangana is conducting this deecet exam. TS DEECET 2020 is conducted to give admissions in Diploma in Education courses . Applicants who want to join in those particular courses can apply for this TS DEECET Notification. Last date for the submission of Telangana DEECET online application forms are April 2020(without late fee) . The qualified candidates in this test can get the admission into D.Ed regular course in the Diet colleges in Telangana State for the academic year 2020-21.